I was a big Roald Dahl fan as a kid (I even read some of his books today). One of my favourites was The Witches (later made into a film starring Rowan Atkinson and Angelica Houston). Those familiar with the book will know that the Grand High Witch had to walk around in public with a mask over her face because she was so ugly and putrid underneath. The mask was a front; a cunning disguise which permitted her to walk around in anonymity. Only the other witches were allowed to see her true self. For the Grand High Witch read Sinn Fein/IRA. Fair Deal, one of the few remaining decent contributors to Slugger O'Toole, unwittingly brought this to my attention. Whilst the rantings of complete soap-dodging idiots with pseudonyms such as Prince Eoghan (Princess Tiny Meat more like. Montgomery Clift fans will understand the pun) can go largely unnoticed, the opinions of Sinn Fein/IRA councillor for Cookstown, Michael McIvor, most certainly can not. For dear Mr McIvor opines that the 'dissident republican groups' cannot be taken seriously because 'they have never killed a member of the British forces.' He then goes on to describe the Continuity and Real IRA movements as.........hold on to your sides...........'Brit loving'!!!!!!!!!!!!!!!! What gave me the biggest giggle was the pathetic defence launched on McIvor's behalf by the usual Sluggerette Slugs. One contributor who goes by the name of Seabhac Suilach (Oirish for 'Sick Twisted Scumbag') opined that McIvor was actually trying to dissuade impressionable young soap-dodgers from joining up by emphasising the dissident lack of gravitas. Wow, some reverse psychology there, Seab! Another regular, Stephen Copeland, who did his school maths tests on the theme of counting Northern Catholics, prefers to highlight McIvor's legal mandate, whilst remaining deafeningly silent on the sheer evil of what the man is spouting. Why should I be surprised. Killing people and the capacity to do so is what makes republican groins tumescent at the thought of Martin McGuinness resplendent in his balaclava. Will McIvor be expelled from Sinn Fein? Highly unlikely. He only says what the rest of the vermin think. If Osama Bin Laden had said such remarks, would Blair et al be encouraging the democratically-elected government of Afghanistan to share power with Al Queda? No! So why should any self-respecting democrat contemplate giving political power to this rubbish? Princess Tony comes to Northern Ireland and takes time out from his busy schedule of pushing forward the IRA/Sinn Fein agenda to pay tribute to the Northern Ireland soldier killed in Afghanistan. The man, who is believed to be from the Coleraine area, was one of two members of Britain's Special Forces ambushed by the Taliban in the Sangin Valley, northern Helmand province on Tuesday. All tribute to such brave men is welcome, of course. 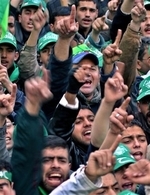 GAZA - THE R&D SOLUTION..
"When the (Palestinian) rockets now hit Sderot after Israel's withdrawal from Gaza, Olmert and his people respond mainly with a new round of RRH. The laughter from Ramallah was deafening. Let's note that, back before 1993, when Israel held Gaza tightly with on-the-ground military rule, there were no Kassam rockets in Gaza. The Palestinian savages threw stones at Jews because real weapons were hard to procure. The PLO knows what we all know; namely, that Olmert is afraid to take the only action that, in the end, can end the shooting of Kassam rockets into Jewish homes - R&D, or Re-Occupation and DeNazification. Let's hope his successor will be less pusillanimous. TORIES DESERT CALL ME DAVE! Well now! Wasn't Call me Dave Cameron's new uberliberal Conservatism supposed to win over hearts and minds and herald in a new era for this once proud but now tatty Party? Mmm..obviously the electorate in Bromley and Chislehurst, in south-east England, didn't get the memo. The Conservative 2005 majority was slashed from 13,342 votes to 633 by the Lib Dems in the By Election caused by the sad death of the likeable Eric Forth.I see that Francis Maude, Conservative Chairman, has decided that what this REALLY means is that the Cameron reforms need to be even wider, deeper, faster. I started flying across to Northern Ireland to watch July 12th parades towards the end of the 1980s. This continued through the 1990s; in fact the last Twelfth I went to over there was in 2002. I was staying in Drummore on the Galloway Rhinns and decided to spend a couple of days in Northern Ireland to soak up the atmosphere. One of the most abiding memories of that day was the unbelievably heavy downpour as the marchers and bands returned to Belfast city centre. I was drenched by the time I returned to the Holiday Inn near the Dublin Road and I had to take a hot shower and a change of clothes before venturing out again. When I look at all the lies and propaganda spouted by Oirish nationalists pertaining to the so-called 'dark side' of Orange marching culture, I am reminded of the reputation of my favourite film, Jaws, and the effect it had on shark populations around the world. 31 years ago this classic movie was into its first month of release in the United States. Within six months it would become the, then, highest grossing Hollywood picture of all time. I have read a great deal about the what has become known as the Jaws effect. Even though I adore the film I am also acutely aware of how misrepresentative of shark behaviour it is. Sharks do not lie in wait off beaches ready to gobble up the first unsuspecting swimmer that comes by. Benchley and Spielberg gave their shark a calculating brain whereby it could premeditatingly take the lives of umpteen swimmers and, if necessary, the three men charged with hunting it down. Despite all the subsequent documentaries portraying sharks in an entirely different light, people still tell me of the fear they have in going swimming - even though they first watched scenes such as the one below more than 3 decades ago. Why am I elaborating on my favourite movie when I should be talking about the Orange Order? Simple! I am making comparisons over the power of propaganda: in Spielberg's case it was the propaganda for the sake of promoting a very powerful movie (the effect on the reputation of sharks was unintentional); in the case of Oirish nationalists it is a systematic attempt to fatally undermine the reputation and, ergo, the existence of the Loyal Orders. Look at the latest rant from Bigoted Bri! 'The Orange Order has been the cause of civil disorder in Ireland since its foundation.......They are the Ku Klux Klan marching through Harlem, the National Front marching along Brick Lane in London.' Having digested BB's infantile gibberish, please take a look at the picture below. 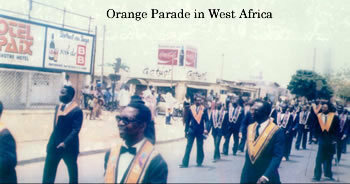 It shows an Orange Order march taking place not in Belfast, Glasgow or Liverpool, but in the Togolese city of Lomé. Correct me if I'm wrong, but aren't the marchers all black blokes? Either they are black, or I've forgotten to take my sunglasses off. So where does your analogy to the Ku Klux Klan or the National Front stand now, Feeney me ol' mate? I have one crucial advantage over the many trolls who will now, in all probability, flood this thread with anti-Orange or anti-McCann sentiment: a wide experience of attending Loyal Order marches. I have done so in Ulster, Scotland and in Liverpool. These are not displays of antagonistic evil, but demonstrations of Protestant culture, loyalty to the Crown and, in the case of UK parades, a commitment to the Union. The latter is the reason - the ONLY reason - why nationalists hate them so much. So what else could we expect but criticism at the very welcome news that the OO has received £100,000 of government cash to help promote the Twelfth and make it into a tourist magnet? Schomberg House wishes to transform the 12th July into the equivalent of the Notting Hill Carnival (although since I have never read about any murders taking place on the 12th, I think the difference is already established). Nationalists are fuming. Just imagine tourists flocking over to Belfast and, after witnessing a colourful day of Unionist culture, finally realising that nationalist nay-saying is nothing more than unadulterated bigotry and spite. Good luck to the Orange. Finally, I have one message for all those who are preparing for the event. Don't choke neighbourhoods by burning tyres at 11th night bonfires. The stench IS unpleasant. Stick to burning Irish Tricolours. It is much more enjoyable. The US Supreme Court has become a shrine to latter day liberalism over the years, and it is only in recent times that President Bush has tried to redress the imbalance. Of course these things take time and so it comes to pass that the Supreme Court has concluded that the Administration had overstepped its authority in setting up military tribunals to deal with the Jihadists at Gitmo. Amazingly, the ruling came in response to a case brought by Osama Bin Laden's ex-driver, Salim Ahmed Hamdan. He is one of 10 Guantanamo inmates facing a military tribunal, but demanding to be tried by a civilian tribunal or court martial, where proceedings would be more open and defendants would have greater access to the evidence against them. Now, as Victor Hanson points out, we would be inviting thousands of lawyers and public defenders to argue, on behalf of their clients, that we are not in a real war but simply prosecuting common criminals. Numerous trials and appeals as costly and circus-like as the drawn-out spectacle of Zacarias Moussaoui (the so-called 20th hijacker) would likely follow. And, in the end, Europeans would still object, since the U.S. would be exposing foreign nationals to possible death-penalty sentences. So, in essence, we would have to set them all free, pay them compensation for their bother, and admit defeat in the war on terror if we are to win liberal and Islamic hearts and minds. Bush is 100% right not to let the murderers go free. He should go to Congress and get their support for going back to the Supremes to change this atrocious decision. Of course as someone else has pointed out, in its judgement, the Supreme Court claims that the terms of the Geneva Convention apply to the Jihadi spawn at Gitmo. Well, according to the same Geneva Conventions, those fighting out of uniform or in a civilian area can be executed on the spot (or later I suppose?) Can we please force Bush to do that as well? Or is that some parts of Geneva apply but others don't - you know, the bits that might actually help us? So , who saw "Question Time" last night? Appalling stuff. Let's review the panel. The Good, the bland and the Ugly. First, the good. Melanie Phillips. Great contributions in the teeth of the anti-Israeli frenzy of the audience and panel. Her co-panellists appeared not to even appreciate that Hamas is openly dedicated to the DESTRUCTION of Israel. Melanie gave intelligent and thoughtful answers though she was outnumbered 4;1. I know the feeling. In a case like this, because you argue against the BBC accepted line - your opponents get four time the air time you do, so it impossible to respond to every stupid allegation made. Then the bland. Labour's Mike O'Brien was dreariness incarnate, though he made a few reasonable noises on a few questions. The the ugly. Julie Kirkbride. Yes, I have to admit she is one of the easier-on-the-eye Conservatives but she was pathetic. Did you hear her talk about seeing Call Me Dave's performance on the Jonathan Ross programme AFTER she admitted not seeing it?? Alex Salmond showed her up for what she is on this. Sorry Julie - but as Melanie pointed out, you personify how fallen British Conservatism has become. Dreadful. The SNP's Alex Salmond was quite witty, quite personable and political wretched. The thing about Nationalists of whatever hue is that they can't see beyond the length of their nose. Nicol Stephen from the Scottish Lib-Dem's was appalling, but then what Lib-Dem isn't? The audience were the usual foaming at the mouth bunch of gather-up Leftists that we expect. I'm surprised they didn't spontaneously break into a chorus of the Red Flag. I wonder is everybody in Perth so barking? 1520 - The Aztecs revolt against Spanish conquistador, Hernando Cortez in Mexico. 1894 - Tower Bridge in London is opened to traffic by the Prince of Wales. 1936 - Publication of Margaret Mitchell's Gone With The Wind. 1940 - German troops occupy the Channel Islands. 1960 - Alfred Hitchcock's Psycho premieres in New York. 1997 - UK sovereignty over Hong Kong comes to an end as China formally takes over the colony.